Here is a list of dishes from a typical Chinese vegetarian place selling what seems to be meat but isn't. “Repent And Be Saved” (Vegetarian Shrimp, Sweet and Sour, Red Cooked or Curry Flavoured) 回头是岸 (素虾、糖醋、红烧、咖哩味) N/A. To go back to Buddhism and Taoism, it is a mistake to assume that genuine followers of either (or more usually a mix of the two) are necessarily vegetarian. Many Chinese Buddhists are not. In fact the Dalai Lama states in his autobiography that he is not vegetarian. It would be very difficult to survive in Tibet on a vegetarian. Indeed. Of course, I accidentally omitted 'diet'. I have edited. Thanks liuzhou; very interesting. Takeaway chow mein and chilli-garlic beancurd are as far as I've got. Seems like there's more to know, right? I have seen several suggestions on the internet on how do deal with the problems of getting vegetarian food in China (and the near impossibility of getting vegan food). As ever, I am highly sceptical that many of them work. One reason is linguistic; the other cultural. The most common suggestion is to learn the phrase 我吃素 (wǒ chī sù) which is probably the simplest way to say "I am vegetarian". The problem with this suggestion is that you really have to get the pronunciation right and Chinese being a tonal language makes this difficult for speakers of non-tonal languages such as English. The second thing is that even if you get it spot on, there is no guarantee that the waitress won't say (in Chinese) "Oh I see. So you don't eat meat. I will bring you some very delicious chicken instead! And scatter some dried shrimp over your fried rice. It tastes much better that way," leaving you utterly bewildered by this barrage of incomprehensible and useless Chinese. Many visitors have learned that people either just don't understand (or don't want to understand) visitors' Chinese, or they get the three words you have painfully learned, then assume you understand everything and lay into a full length lecture on the folly of your failure to be sensible and eat the bounty of the animal kingdom, nose to tail, while you sit there dying of malnutrition. So, I'm trying here to avoid giving 'useful' phrases. As often as not they just confuse things further. (Even speaking the language or travelling with native speakers to guide and translate doesn't usually help. You still run into the refusal or inability to comprehend vegetarianism. Then there is the problem with the 10,000 dialects.) I recommend the pointing system. Another tip I have heard, but never tried (I don't need to; I eat everything) is to not say what you don't want to eat; but to point out (perhaps literally) what you do want to eat.. It is not considered offensive in most small Chinese restaurants to wander into the kitchen, open fridges and cupboards etc and indicate what you want. Don't do this at peak hours, 12:00 to 13:00 where I am, but variable. Also, examining other diners' meals (more or less discretely) and pointing to them if they take your fancy often works. This is probably the easiest to deal with. Hit the street early enough (most Chinese people get up early) and you will find little stalls everywhere selling all sorts of stuff. 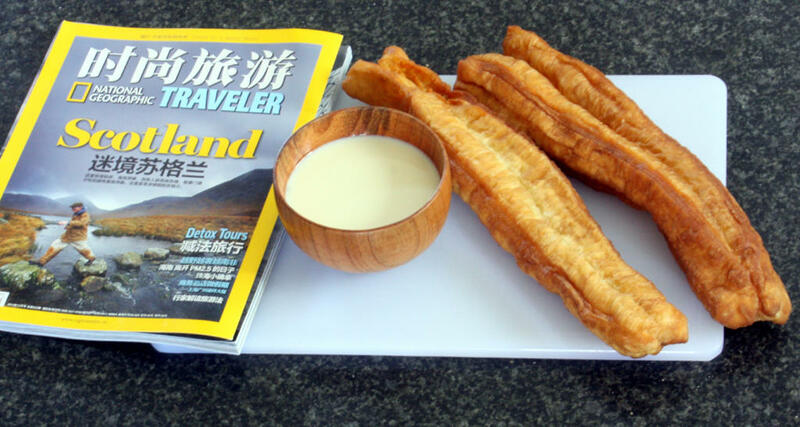 Perhaps the most popular breakfast is dough sticks (cruller) served with soy milk . You will see the foot long sticks everywhere, but when served they are usually cut (with scissors) into chopstick manageable pieces. I'm going to go out on a limb here and say they are probably fried in vegetable oil (it's cheaper) but it can't be guaranteed. The soy milk is, of course, vegan. Other breakfast items include the many steamed buns. Some contain meat, sometimes signalled by the meat character (肉), but not always. Then there are the pancake type preparations. They are cooked in front of your eyes and you can see what they are putting in them. Usually egg, spring onions/scallions, coriander/cilantro etc. Again no guarantee what the cooking oil is, but probably vegetable. Also, there are the noodle places. Many of these set the ingredients out in front of you and you point at what you want to be included. Problem here is they may well serve the noodles in a soup made from chicken stock. Many hotels (esp. tourist hotels) do buffet style breakfasts. These can be a good time to fill up for the day. You can see the food before you commit yourself. The amount of food I see people eat at these breakfasts is amazing. I'm sure they don't normally eat such a big breakfast at home. Boiled eggs, fried noodles (fried in what? 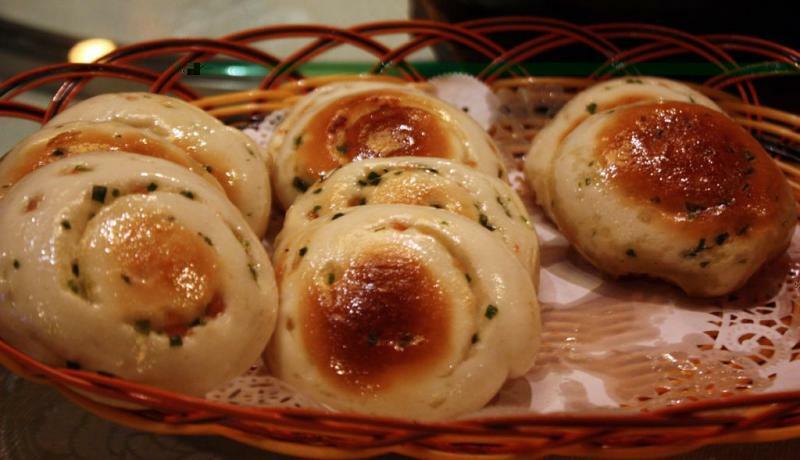 ), buns, breads, cakes, rice porridge. I forget. It's been a while. Some even do cornflakes. Coffee will nearly always be instant, often pre-sugared and with whitener already added. Lunch and dinner coming soon. I am getting hungry,so going for a break. 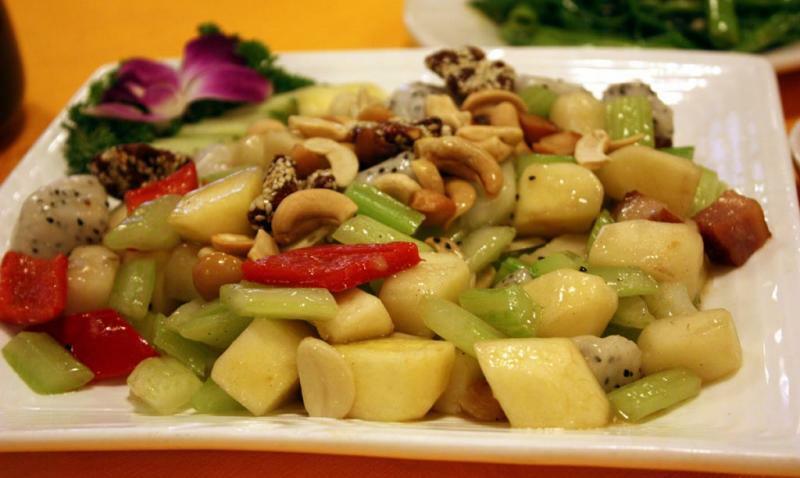 Liuzhou, is it true that in a New Year's feast, there has to be at least one vegetarian dish? dcarch, I'm not answering for Liuzhou but within the circles of the Chinese diaspora that fall within my experience a vegetarian dish¶ is "traditional" - usually for either the Big Dinner on New Year's Eve or on New Year's Day§ - but not obligatory in more recent times. 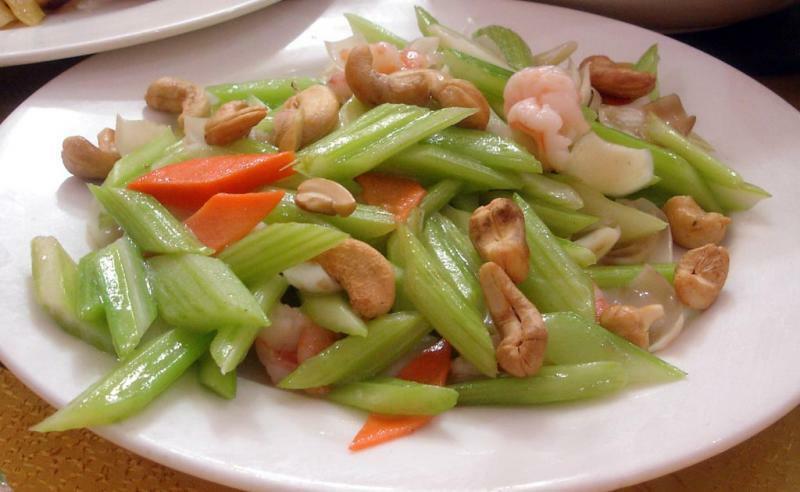 Even with my parents' generation such a dish was not always made/ordered/whatever but nevertheless when such a dish (see below) was on the table one ate at least a mouthful or two of it, especially the "fat choy" in it. Liuzhou will, no doubt, let us know what the practice is in Mainland China. ¶ This was traditionally what is known in the Western world as "Buddha's Delight" [羅漢齋; Yale Cantonese lo4 hon3 jaai1], which should have something called "fat/fatt choy" (in Cantonese) in it, a near-homonym for the prosperity/good luck part of the traditional greeting "Kung Hei Fat Choy". Whether the dish is vegetarian (or vegan) will depend on what exactly goes into it, as there are many different renditions of it where although the "core ingredients" are present, other variable stuff may be added to it - let alone what oil is used to cook it. Oysters (dried) are often added in - that is vegetarian, I think? - but scallops (dried) may also be put in or substituted - and scallops are not vegetarian, if my information is correct. And so it goes. § Traditionally, one was not supposed to cook (or perform manual labor) on New Year's Day [so folks who *had* to bemoaned their fate] so leftovers from the Big Dinner the night before was eaten for New Year's Day - or one went out for a meal, when those who *had* to work since they were in the restaurant business served you. Some people, especially of the older generation, did make an effort to "sek jaai" ("eat vegetarian") on the first day of the New Year to "purify" themselves - again, within my experience when growing up - so that dish of lo hon jaai came in handy on that day. Liuzhou, nice thread and posts. I don't know about "has to be", but there usually is at least one at any celebration meal or banquet. Before getting on to lunch, a few more thoughts came to mind about breakfast. If you are of a sensitive disposition in the morning, like me (especially after a particularly liquidly refreshing evening) I suggest avoiding hotel breakfast completely. There is nothing many Chinese people like to do, especially the more elderly, than go for breakfast and have a good shout. The breakfast rooms are cacophonous. Which brings me to Yum Cha or Morning Tea. Originally from the Cantonese speaking parts of China, but now available pretty much all over, Yum Cha (simplified Chinese: 饮茶; traditional Chinese: 飲茶) is what is generally referred to as DIm Sum in western countries, although strictly speaking dim sum (simp: 点心 ; trad: 點心) is the food served at a yum cha meal rather than the event itself. Dim sum literally translates as 'little hearts' and consists of mainly small items such as filled buns, rice noodle rolls, cakes etc. In traditional places these items are wheeled round the restaurant on trolleys and you take your pick of what passes by. Some of these 'little hearts' are vegetarian; most are not. It isn't easy to tell just by looking however. Many a surprise may be lurking inside an innocent looking bun. Two of the three buns below are vegetarian. One certainly isn't. But which? The answer is the front one. The two at the back contain sweet bean paste (left) and sesame and peanut (right) - the one in front is a pork bun. Tread carefully and put in your earplugs. Another possible breakfast option is noodles, predominantly rice noodles in the south and wheat in the north, although both can be found most places. Most small noodle places prepare these to order and have bowls of ingredients for you to point at. Beware, however, of them adding stock which will not be vegetarian. Dry noodle dishes are available, but not everywhere. 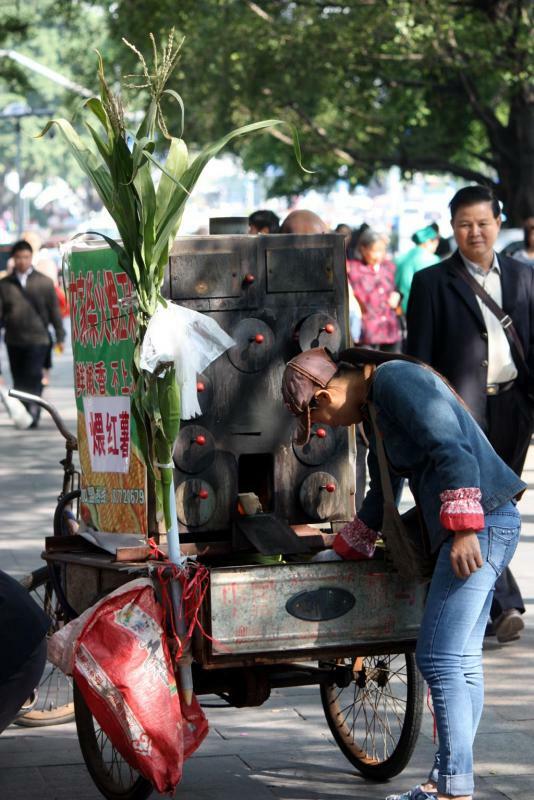 then hit the streets and find the local snack people. They can keep you going on steamed or roast corn, roast red potatoes, pickles, roast chestnuts, peanuts, fruit etc etc. The supermarkets sell yoghurts (usually very sweet and thin) and soy milk. Fresh cow's milk is more difficult to obtain outside of the large cities - few supermarkets carry it. Western style bread is also difficult to find, although some places do French style baguettes which are passable if fresh. Before I get onto lunch and dinner, here is a quick illustration of the problem for vegetarians in China. Celery, cashew nut and carrot - perfect. No. Not quite.Let's add some shrimp to perk it up. What does a fruit salad need to beef it up? Yes! Beef! 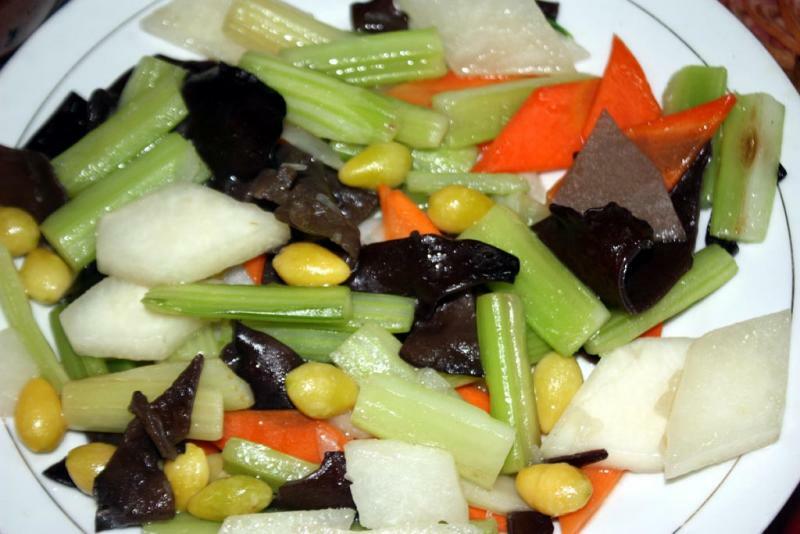 Some simple vegetables to munch on aren't quite good enough. Lets add some chicken's feet! 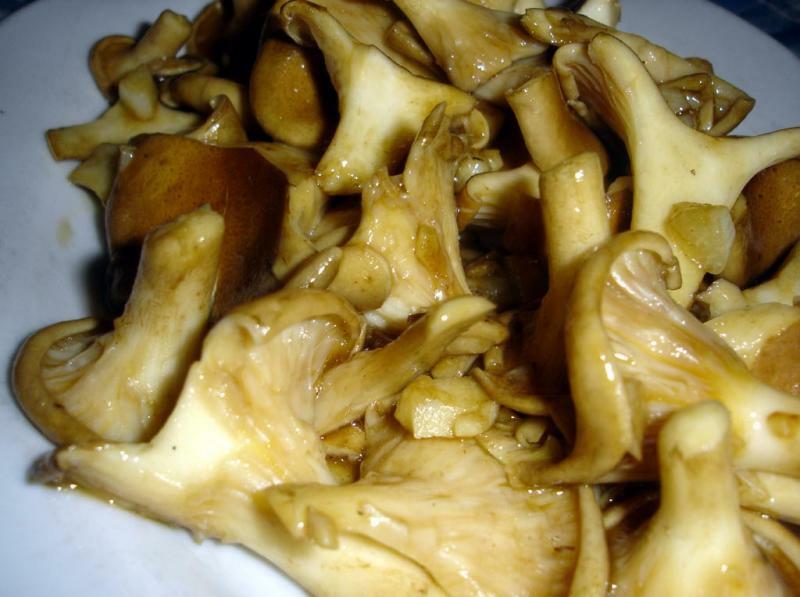 Some beautiful stir fried oyster mushrooms. They are vegetarian. Nope. They were fried in lard (pig fat) to improve the taste. 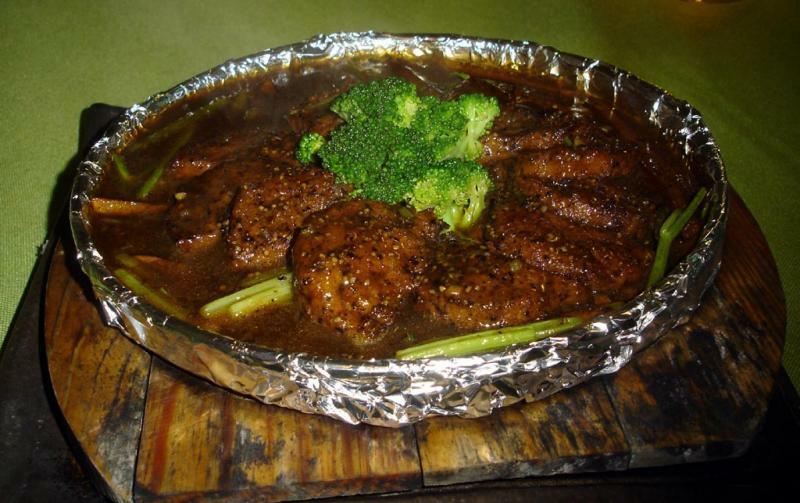 A recent blog article on one of the travel sites (I forget which) listed "China's five top vegetarian dishes". Three contained meat. The article was withdrawn after scorn and derision was poured on the writer. Vegetarian "Beef" from one of the many Chinese Buddhist Vegetarian restaurants which specialises in dishes which look and taste like non-vegetarian dishes. Why? Fake chicken from the same restaurant. See menu in post 2 above. Oysters (dried) are often added in - that is vegetarian, I think? - but scallops (dried) may also be put in or substituted - and scallops are not vegetarian, if my information is correct. Oysters are certainly not vegetarian. Whatever gave you that idea? They are no different from scallops in that. No shellfish, mollusc etc is vegetarian. whether I agree with these notions or if they make perfect sense is another issue. Not an argument I'm going to get into either. I've heard people insist that mushrooms aren't vegetables but are some kind of animal. There are a lot of strange ideas in a lot of strange minds. Apologies for the late serving of lunch and dinner. Work found where I was hiding and demanded my attention. China doesn't really differentiate between lunch and dinner, in the sense that the same dishes could be served at either. Family home lunches often include leftovers from the previous evening's dinner and dinner will have lunch's leftovers. 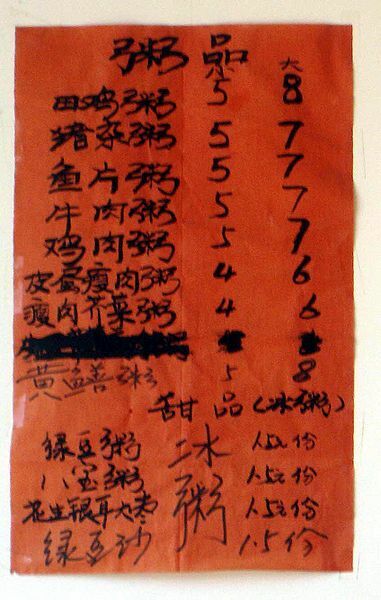 Also, I don't remember ever coming across a restaurant in China which had separate lunch and dinner menus. Again, if you are self-catering there is no problem other than being overwhelmed by choice. For those dependent on restaurants etc, again it becomes difficult, for the reasons given above. I've been checking out the internet and the suggestions there. 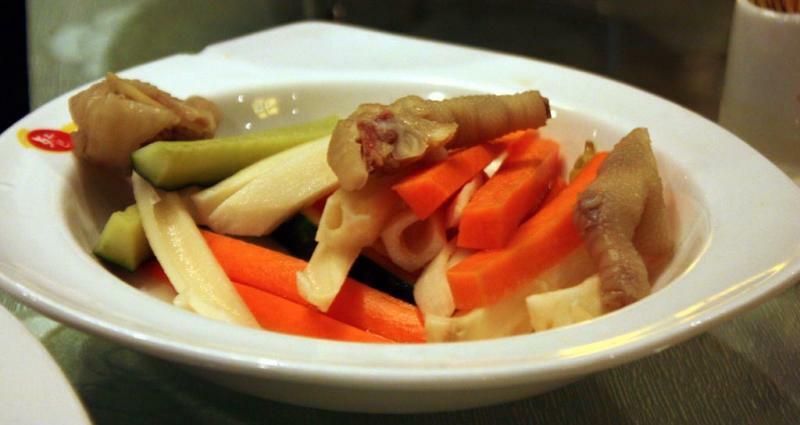 One common suggestion is to try to find hot pot restaurants. These are basically self-catering in a restaurant setting. You order up the ingredients you want and cook them yourself in the boiling broth in the centre of the table. 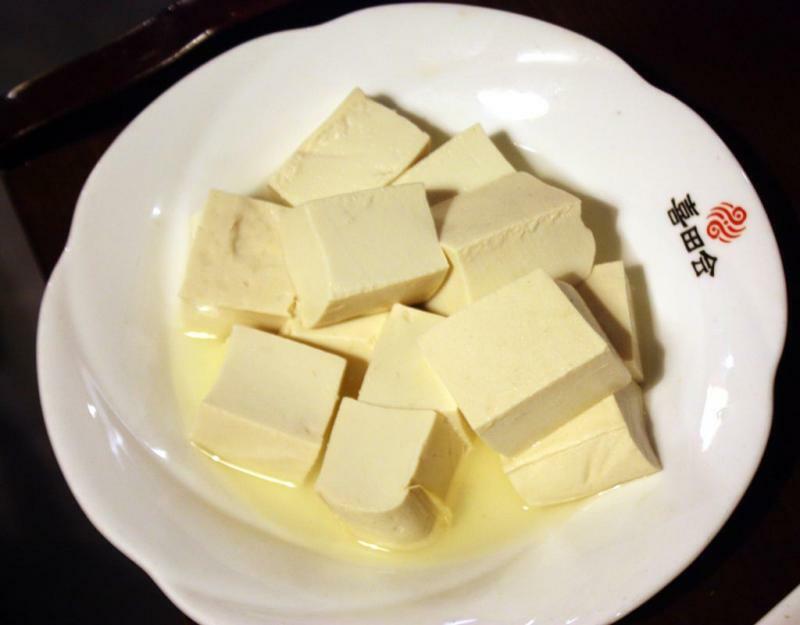 Common vegetarian ingredients include tofu in various forms (try frozen tofu for an interesting texture), mushrooms of all kinds (fresh and dried), noodles (often vermicelli or glass noodles, lotus root, potato, bean sprouts, broccoli, various marrows, pea leaves, coriander / cilantro, seaweed, taro, etc etc. Sounds great, but there is a problem. They are going to bring you a big bowl of boiling stock to cook your goodies in. And it is 100% certain that the stock won't be vegetarian. Most will be chicken based although the very popular Sichuan style spicy hotpot base traditionally uses both beef dripping and beef stock. I have a Chinese hot pot cookbook in front of me now. It has 34 different soup bases. Not one is vegetarian. I had a conversation last night with a Chinese friend in which we discussed the best way to deal with this problem. We agreed that they aren't usually going to make you a vegetable stock. They are far too busy. Even if you ask for vegetable soup, they are going to add chicken (probably stock cube or powder). So you ask for plain boiled water. They will understand that and bring you a glass of hot boiled water to drink. Finally we settled on the clumsy phrase “要一锅开水代替汤底 yào yī guō kāi shuǐ dài tì tāng dǐ” which means “I want a pan of boiling water as a replacement for the soup base.” We are still highly sceptical that this would actually work. Someone in the kitchen will probably decide to perk it up with a bit of animal - and MSG. And even if it did work, you would have to effectively make your own stock with the boiling water and some initial vegetation; otherwise you will just be eating boiled mushrooms. Perhaps a better idea is to find one of the many restaurants which hand you a ticket when you arrive, then you wander up and down a long line of cooking stations pointing and choosing the ingredients and food you want. They stamp your ticket and, in theory, when you get back to your table (don't forget which number it is – these places can be huge) the food may well have already arrived. The ticket becomes your bill. 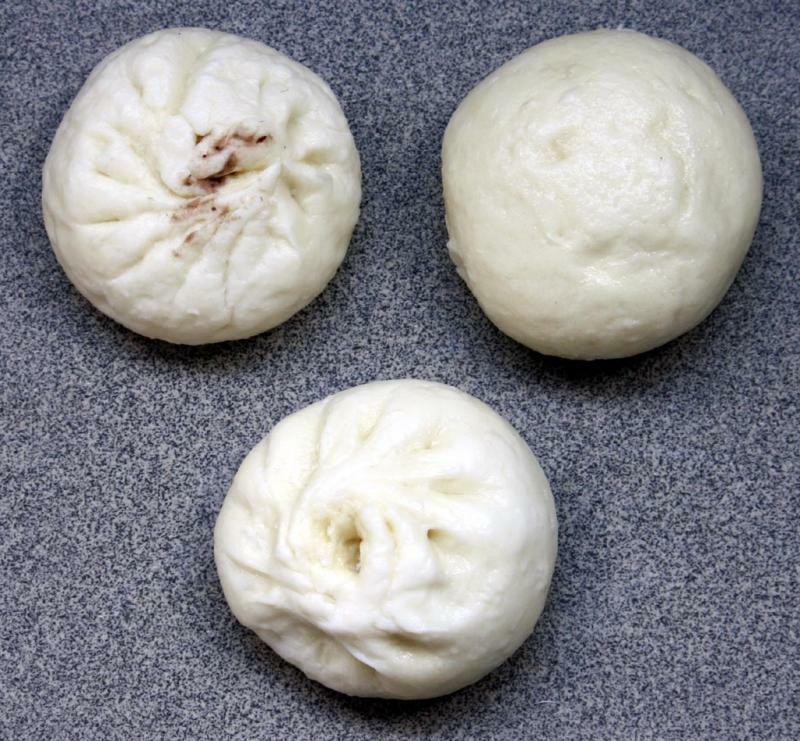 You will still have the problem of guessing what is in pre-prepared things like dumplings and steamed buns (almost certainly meat - see breakfast above). But the chances of hitting on something acceptable is higher than choosing from a undecipherable menu. Many places have picture menus which may help. But remember that pictures of food often hide a multitude of things. The pictures are not usually over-stylised or fake, but you can't, in particular, know what oils or stocks are being used or what is lurking beneath or within. I have to mention egg and tomato (西红柿炒鸡蛋 (xī hóng shì chǎo jī dàn) aka 番茄炒鸡蛋 (fān qié chǎo jī dàn). This renowned dish has kept any a vegetarian alive while in China, although one friend who was here for three years has sworn never to eat egg and tomato ever again. It may not be on the menu, but there isn't a cook in China who doesn't know how to make it. It is the first dish all Chinese kids learn to cook. Basically, just scrambled eggs with tomato and maybe some spring onion/scallion. Dead simple. There are a zillion recipes and videos on the web. Some noodle places do vegetarian options. One big chain is the Japan/China franchise operation – Ajimen. They have a few vegetarian options. Menu has pictures and English. Here in town, we have a Hong Kong noodle place which has a couple of vegetarian options. Again an English translation and pictures. China seldom does salads as they are known in the west. Many or most people have a strong aversion to eating anything raw, mainly for hygiene reasons (see below). Smacked cucumber with garlic (蒜泥拍黄瓜 suàn ní pāi huáng guā), originally from Sichuan but popular everywhere. 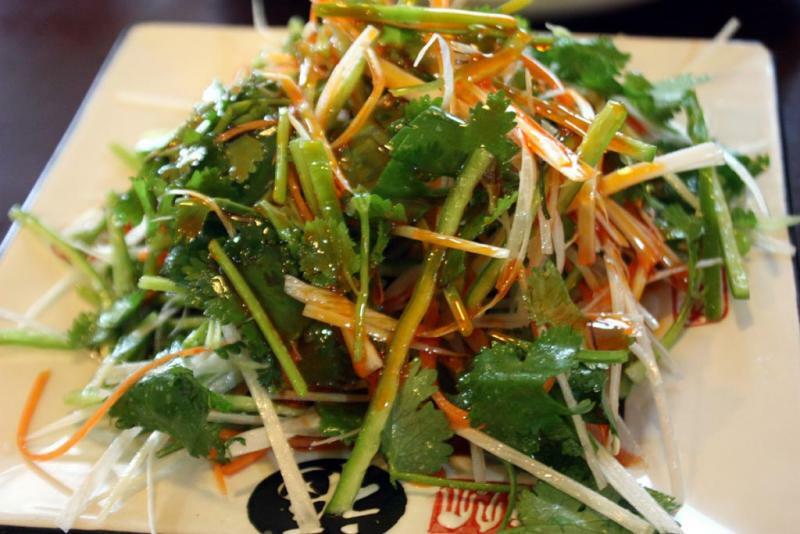 Tiger salad (老虎采 lǎo hǔ cǎi). There are two versions: one from northwest China up near the border with Siberia and another from the far west. Both are very good. The one pictured is the NW variety. Not so easy to find, but if you do, I heartily recommend it. 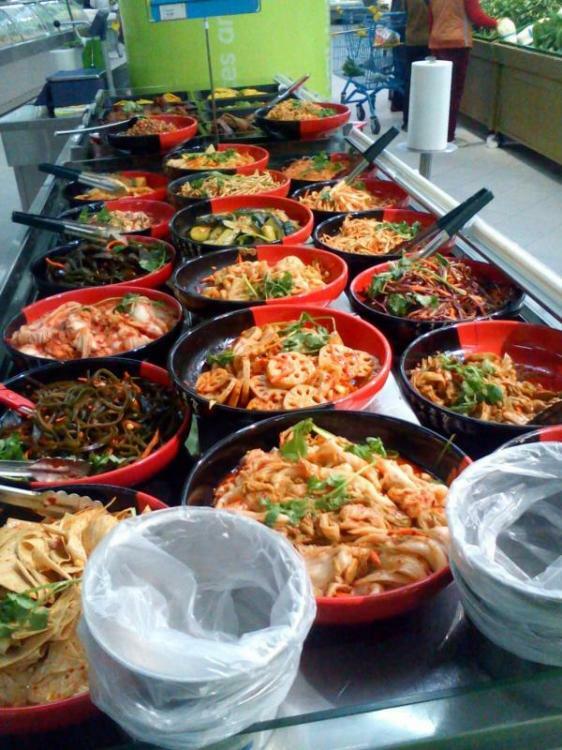 Most supermarkets do a variety of Chinese style ‘salads’ or prepared dishes which can make up a great lunch. You can see what you are buying (usually). Be very wary of birthday cake! I don't think the Chinese ever really got the baking concept. Their ‘bread’ is nearly all cake and their cakes nearly all fat. Pig fat. Yes. They make birthday cakes using lard. Not always but often! Accept it now. You are not going to get a vegetarian meal on a plane or train anywhere in China. Some airlines (actually they are all the same airline – they all belong to the government. We are communist here.) have claimed to offer vegetarian meals if you book them five years in advance or something similar. I've never heard of anyone receiving one. Do what the locals do (for different reasons). Stock up on snack foods. Peanuts, potato chips/crisps, fruit, chocolate, candies, cakes and cookies. Work out how much food you need for the duration of your journey, then buy twice that. You will see lots of people eating instant pot noodles on trains. Each carriage has a boiling water supply. The pot noodles aren't vegetarian either. I have a little more to add -mainly summary and some random thoughts that otherwise escaped. Later. In a related sense, here is an anecdote from when I visited M'sia and was treated to dinner (with my siblings and mother) by my late father's closest friend's wife at a posh Chinese restaurant. Dish upon dish of marvelous meat-based things came streaming out - but I and my siblings, after a week there, were longing for veggies. Yes, meat and yet more meat had always been regarded as "status symbols" in Chinese cuisine and hospitality, I certainly recognized that. Yet... Finally I gently asked our host if I could ask for another dish and of course she agreed - whereupon I asked the waiter for a certain vegetable in a nice sauce and when it arrived fell upon it (together with my siblings) and, after a pause, the children of our host as well. :-) (Do note that none of us were "vegetarians" and I for one like my meat too) In fact, we ordered a second dish of the same thing and we polished that off too. The point of this anecdote is that MEAT is often taken to be the central feature of a meal meant to honor someone in Chinese culture. The trials of attempting to be a Western-style vegetarian in a Chinese milieu, as Liuzhou as illustrated, is a bit of a culture clash. 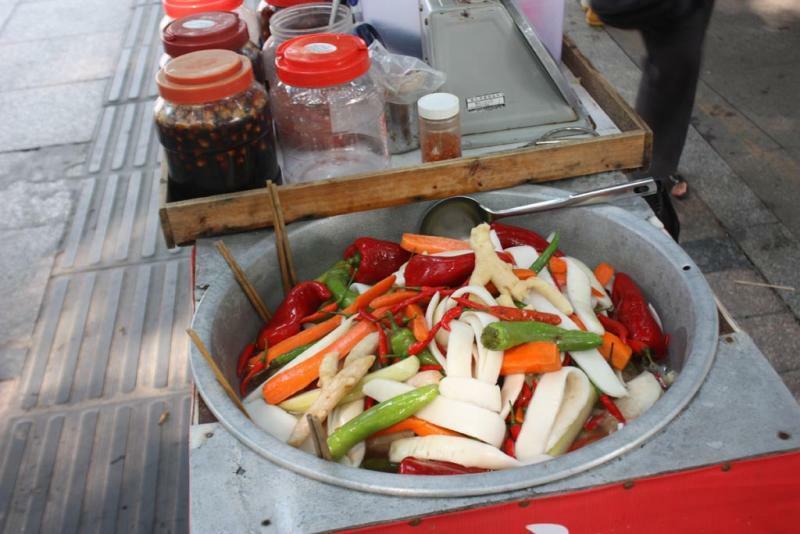 Being a vegetarian in China is easy and exciting and interesting if you are self-catering. For those dependent on restaurants, street food etc it is difficult, but not impossible. The problem is partly a language barrier issue - few restaurants have English menus or English speaking staff - but even Chinese speakers (native or otherwise) struggle. 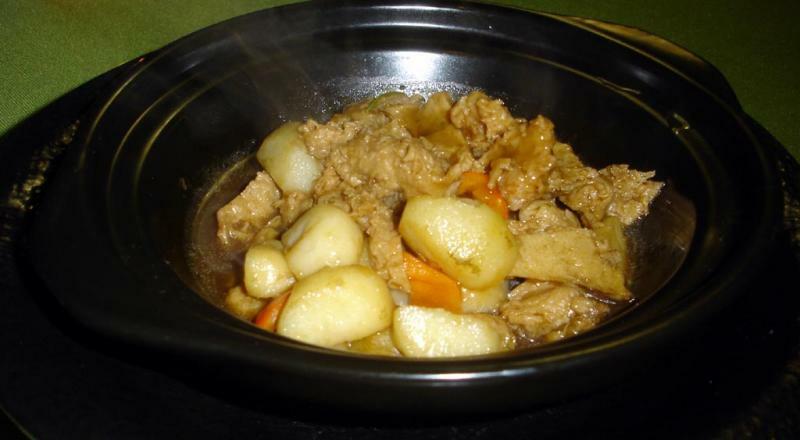 Traditional Chinese cuisine and home cooking is still largely vegetable based, but not vegetarian. Animal fats are widely used for frying and animal products often added to pimp up the veg. 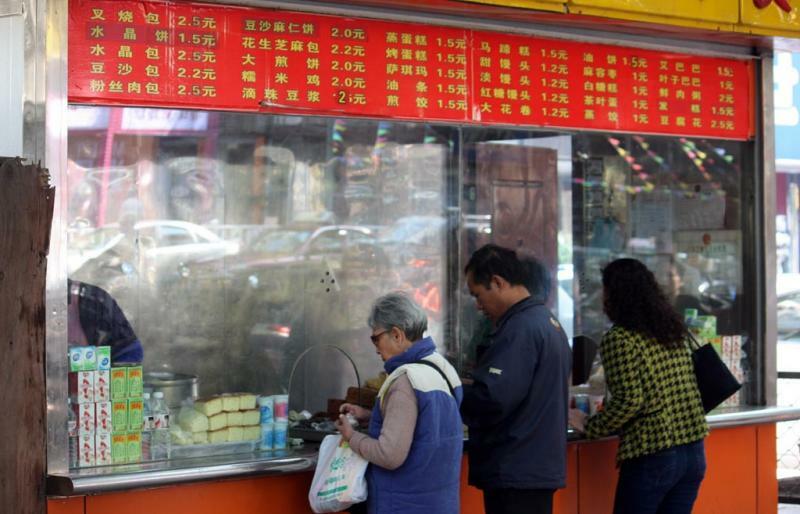 You won't starve in China, but you have to be prepared to work at finding acceptable food. Some people take that on; others give up and leave. Try to see the cooking being done. Sometimes possible - not always. Point out what you want - not what you don't want. But be wary of animal fats being used and what is that strange looking 'spice' being added? Pork floss? Shredded dried shrimp? I have deliberately avoided recommending specific dishes. What is available varies enormously from place to place. 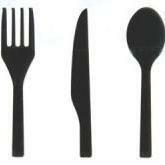 The few dishes or foods I have specified are those I think are available pretty much everywhere. I have no experience of it, but I think being vegan in China would be very problematic unless you were self catering. It's not that the food isn't there. It most certainly is. Veganism is just not understood in China at all. Finally, let me relate an anecdote. A few years ago, I was in a little-known town near the Guangxi - Yunnan border. I was invited to a full scale banquet. (My heart usually sinks when that happens - the food is usually second rate at best. People are only there to get as drunk as possible as quickly as possible.) But to decline the invitation would have been inexcusably rude, so along I went. The food was divine. The hosts and guests were polite, sober and interesting. It was, without doubt, the best banquet I have had in near-on 20 years in China. And it was entirely vegetarian. Or so they told me! A fuller and corrected version of this is available here.